However please note there is I feel one more which is Project Scope which Ive covered off in a separate page. This relates to the deadline set for the project to complete and launch. Sometimes it is an option that the deadline is moved out, ie lengthened which in turn gives the project more time to iron out the problems and get the work completed. However whilst this is often an option which Corporates will consider, in cases where Marketing are the main Business Stakeholders this will often not be an option as they will already have booked up publicity and advertising campaigns which are hard to re-schedule. Therefore if you are having problems and you as the Project Manager feel that a small extension on the deadline will be all that will be required, then start managing expectations early on, as this will give the Business Stakeholders time to re-plan their activities without looking like muppets. However be extremely careful in doing this. If you genuinely believe that a small extension of a few weeks or even a month will be sufficient then fine. I have however seen many instances where Project Managers were too terrified to admit that in fact their project was in such a mess that it would take several months to resolve. They have then asked and been given the one month extension only to have to go back to the Business Stakeholder asking for more and more time. The Project then quickly becomes the laughing stock of the company, the Business Stakeholder looks like an idiot and the Project Manager ends up with a bad reputation and unemployed very fast. If you require further information on what to do in these instances then please go to the page on Managing Expectations. This relates to the overall budget allocated to your project and should have been set from the amount stated in the Project Justification, Business Case, PID and EA (Expenditure Authorisation). In many projects throwing more money at the problem will help by allowing more resources to work on the project, perhaps enabling equipment to be bought faster and hiring 3rd party suppliers in. Often this is the option Corporates are happiest with. However if you think that this will help then make sure when you estimate how much additional budget is required, make sure you over-estimate the figure. After all the Corporate is going to be unhappy whatever the figure so you might as well make it as large as you can to cover any eventuality. John has a budget of $5M and his project is rapidly moving to red status over the budget because a PO (Purchase Order) wasnt approved for the hardware and when the supplier re-quoted, the exchange rate between Euros and Dollars had gone the wrong way and the cost had increased by $500,000. So what does John do? Does he bite the bullet and ask for the additional $500,000, or does he in fact ask for an additional $750,000 knowing full well that testing is resource light and as a result likely to miss their deadlines? John of course asks for an additional $750,000, negotiates like mad with the equipment supplier and reduces the currency differential down to $450,000. He then uses an additional $200,000 to beef up the testing team who promptly meet their deadlines. So John delivers on time and with a budget surplus of $100,000 remaining. He looks like a capable, effective and efficient Project Manager who can be trusted with the important projects. So when increasing budget make sure you think smart as well as efficiently. 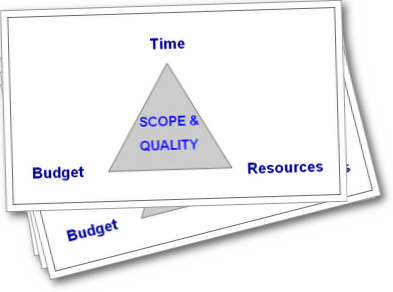 Project Management isnt only about delivering projects. Its also very much about managing perceptions, being a good negotiator and always being politically aware.